Two of music’s most iconic artists - Sting and Peter Gabriel - will unite this summer for a once in a lifetime concert tour. Rock Paper Scissors, produced by Live Nation Global Touring, will visit select North American cities this June and July (complete itinerary below). Tickets for Rock Paper Scissors will go on sale beginning January 25th. Join the Sting.com Fan Club today and be one of the first to gain access to tickets to see Sting and Peter Gabriel on the road. The Sting.com Fan Club presale begins Wednesday, January 20 at 10am (local). Join Sting.com here! Complete timing and presale instructions can be found on the Tour page. June 24 Wantagh, NY Jones Beach Mon. Sting in Columbus OH. Can't wait. My two favorite artists of all time. This will be my first concert since losing my hearing on my right side in October of last year! Hearing schmearing...... I don't care how it will sound now, I have my tickets and I'm on Cloud 9!!!!!!! Could not start 2016 off any better than this announcement! Two of my favorites touring together! I can not wait for this show beyond excited. CAN NOT WAIT! I've been a Sting fan for years! Never miss a concert! Superb. Looking forward to the synergy of these two talented gentlemen and their collaborating musicians. What a summer show to look forward to on a very cold Wisconsin day. I saw Sting & Paul Simon when they swung through Vancouver. 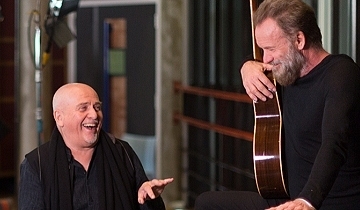 Would love to see Sting & Peter Gabriel in Seattle. I have seen Sting every time he or the Police have come to town except the tour with Annie Lennox which I regret enormously. Huge fan since the early '80s. Still have all my tour memorabilia. This is the most amazing thing that may happen this year in music!! Although there is no show in Vancouver, I will be coming to both the Calgary and Edmonton shows! !